EIGRP has a number of terms that must be understood by a candidate for the CCIE Security written exam. Table 2-10 defines some of the common terminology used in EIGRP. A router in the same autonomous system (AS) running EIGRP. EIGRP maintains a table with all adjacent routers. To view the EIGRP neighbors, use the IOS command show ip eigrp neighbors. 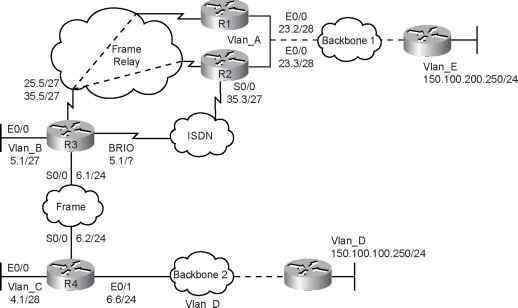 EIGRP maintains a topology table for all remote destinations discovered by neighboring routers. To view the topology table, the IOS command is show ip eigrp topology. A packet used to monitor and maintain EIGRP neighbor relationships; they are multicast. A query packet that is sent to neighboring routers when a network path is lost; can be multicast or unicast. A reply packet to a query packet; they are unicast. Acknowledgment of an update packet, typically a hello packet with no data; they are unicast. How long a router waits for a hello packet before tearing down a neighbor adjacency. Time taken to send a packet reliably to an acknowledgment. SRTT is the average delta between the time a packet is sent and the arrival of the neighbor's acknowledgment. RTO is the time a router waits for the arrival of the neighbor's acknowledgment. Lowest metric to remote network. A condition under which the sum of a neighbor's cost to a destination and the cost to this neighbor is less than current successor's cost. A neighboring router with a lower AD. A neighboring router that meets the feasibility condition. An EIGRP router waiting for all acknowledgments from neighboring routers for all the queries sent. When a router is querying neighboring routers about a network path. Normal route operation to a remote destination.